Trout usually spawn from October to February, depending on the water temperature. They often spawn in smaller streams with good spawning and growth facilities. However, spawning can also take place in the river's main stream channels. The female fish chooses a stretch with a fast flow and stony bottom for spawning. Here, she will dig a spawning pit by lying on the her side and beating her tail fin vigourously. When the female is ready to spawn, she positions herself at the bottom of the pit, after which the male comes. While the eggs are being delivered in a long stream, the male releases his sperm and the fertilized eggs settle in the bottom of the spawning pit between the large stones. Then the female covers the eggs by beating stones and gravel over them. The eggs hatch in April or May, depending on the water temperature. When the yolk sac is used up after about three weeks, the fry leaves the protected environment between the gravel and stones. After typically 1-3 years in freshwater, the young trout migrate towards the sea in the spring season. These trout are now called smolts. When the young trout become smolts, they are also physically adapted to live in salt water, and they change colour from multi-coloured to silvery. Smolt develop in the sea into shiny sea trout. 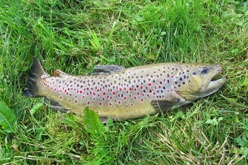 Trout, which remain in the river, are called brown trout. When the smolts migrate towards the sea, they are imprinted by the watercourse. This imprinting means that sea trout later have the ability to find their way back to the spawning ground in the watercourse where they were hatched. After 1-4 years in the ocean, the sea trout migrate upwards to spawn for the first time. The ability to find their way back to the watercourse is called 'homing'. The mechanisms behind this ability is not known in great detail, but it is generally agreed that it is a complex process where the fish use sight, smell and the earth's magnetic fields. The sense of smell seems to have the greatest effect when the trout finds its way back to estuaries, while the sight is most important when the fish find its way into the actual watercourse. Sea trout to a great extent return to the place in the watercourse where they originally came into the world and grew up. It has been observed that a sea trout can use the same spawning ground year after year. It is quite common for brook and sea trout, which are one and the same species, to spawn together. Especially small local brook trout males called 'sneakers' often succeed in fertilizing eggs from large sea trout females. Prevalance in the river Kongeå: Common in mainstream and suitable tributaries. Weight brook trout: Up to 7 kg. Weight sea trout: Up to15 kg. Age: Rarely more than 5 years, but can be older.